Motor sports is dangerous and many incidents over the years have reminded us that this phrase is true, but some times its not the sports itself that is been questioned after an incident but rather the way to handle that incident is, just like last Sunday at Misano during the SanMarinoGP in Moto2 race the incident that took the life of Japanese rider Shoya Tomizawa. He lost his bike’s front end coming out of a fast corner and fell in the path of the 2 riders behind who have no time to react and hit him head on first before hitting his bike which was also lying on the track and fall themselves. The accident was unavoidable and this has been agreed by almost all the fans who has watch the race but the way Race officials and Marshals handle the injured riders was not the best example of doing that at all. The riders involved in the incident apart from Tomizawa, are Alex de Angelis and Scott Reddings. Alex de Angelis was lucky enough to not sustain any injuries and walk away from the crash on his own to safety while Scott Reddings have suffered minor injuries and been taken to the track medical centre. The Standard Operating Procedure in such incident is to stop the race by deploying Red Flag, so that injured riders could get the needed medical attention, which was not been deployed by the Race officials. The second mistake was the way marshals have moved the riders from the track to the ambulance present on the outside of the safety barriers; they put them on the stretcher with out even securing their necks with collars to avoid any more damage to the injuries the riders have suffered and then the big blunder by the team that take Tomizawa away to safety dropped his stretcher from the head side when one of the marshal tripped in the gravel trap. The official statement from the race director and chief medical officer was; they don’t think it was necessary to stop the race as the marshals are already been able to take away the riders to safety, but they forget that a week earlier in Indianapolis GP they have stopped the Moto2 race when at the start 8 riders crashed coming out of a slow turn and neither of them needed serious medical attention. While here one of the riders was lying in the middle of the track totally unconscious and they think it was not necessary to stop the race. We always had a doctor/paramedic/ medical staff on most post, and would only scoop(stretcher) under the guidance of the medical staff in charge on that post….yes we were all taught how to scoop safely as well. The medical staff on the job would have assessed the situation, and advised the IO, post chief, and even there own communication channel. If you watched the TV, some medical staff was carrying the rider off ??? 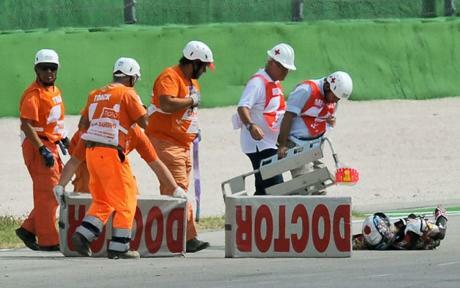 They should really be doing 1st aid, the marshal’s should be carrying the scoop…..it didn’t help when they dropped the poor lad. We don’t know all the facts but i can only guess race control wouldn’t give a red flag……..Live TV really is at fault here…with schedules etc. Perhaps there weren’t enough marshals per post to deal with 3 riders and debris. All clubbie events in the uk would have an instant red flag, as did WSBK at brands hatch a few years ago, and every attempt to give medical help at the track…with out dragging riders off…causing more injuries. Especially unconscious riders with back and neck injuries…really require a lot of time to remove with out further injury’s”. An awesome rider at the top of his game, winning the first round of this new series.”Shoya Tomizawa was 19 years old and was been reckoned as a future star of MotoGP in the coming years. He had won the inaugural Moto2 race at the start of this season in Qatar, and registered his name as the first rider in the history who wins the first ever Moto2 race. Tribute flows all around the paddock towards him: Rossi (World Champion) says, “He was very funny, always smiling and been gentle with everyone”. Pedrosa says, “As a rider he earned respect from everyone in a short time”. Lorenzo(Current MotoGP Championship Leader) says, “He was a good guy and strong rider”. Toni Elias(Moto2 Championship Leader) says, “He left indelible mark on my life”. An investigation is launched by the Italian authorities about the incident and hope it will find the persons responsible for such unprofessional mistakes during the incident. 21-Year-old has cars worth £8 Million.